Once you have chosen your procedure (Grind and Seal or a Mechanically Polished Concrete) and you have decided how much stone you want to see (Nil, Minimum or full exposure) the last thing to decide on is what gloss level you like. 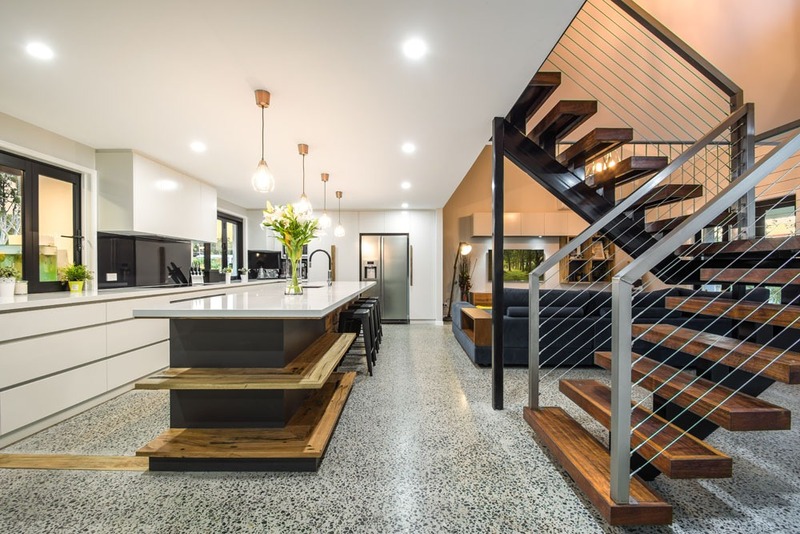 When deciding what type of polished concrete look suits your style there are three things that you need to consider. Why not click here to use our cost calculator to see how varying these three things will affect the overall cost of your project. Step 1 – Decide which method of polished concrete you want – Either a mechanically polished concrete or a grind and seal. Click here to see a video describing the difference. Step 2 – Decide how much stone you want to see showing through your slab – You can choose from a nil exposure (minimal to no stone), minimum exposure (random amount of stone) or a full exposure (maximum amount of stone showing through). Click here for more information and images on stone exposure. Step 3 – Decide how shiny you want your floor to be – Basically you can choose between matte, semi-gloss or a high gloss finish. When deciding what gloss level you prefer it really just comes down to a personal preference, however you might want to consider what is easier to maintain, and that the cost can vary depending on the gloss level you choose. The matte finish is the more industrial/rustic natural look that is used in many homes, cafes, shops and other commercial flooring. It is very easy to maintain and won’t show up dust as easily. The semi-gloss is probably our most popular choice as it still has great shine, but is easier to keep looking clean than the high gloss. The high gloss is the head turning option for people who are after that wow factor and it lends itself to high end and glamorous homes and offices, although it does require a bit more maintenance as it can be a bit more obvious when your floor isn’t spotless – this small point is often totally outweighed by the completely stunning overall look. If you have selected a grind and seal method of polished concrete, your price will not vary between a matte, semi-gloss or a high gloss finish. If you have selected an MPC though, there is a small price increase from matte to semi-gloss, and from semi-gloss to high gloss. This is due to the extra labour involved as basically each time you go up a level of shine, our team have to buff and polish over the entire floor more times and therefore the process takes longer. Showroom appointments can take 30-60 minutes so bookings are essential! Open 9am-5pm Mon-Thu, 9am-4pm Fri.